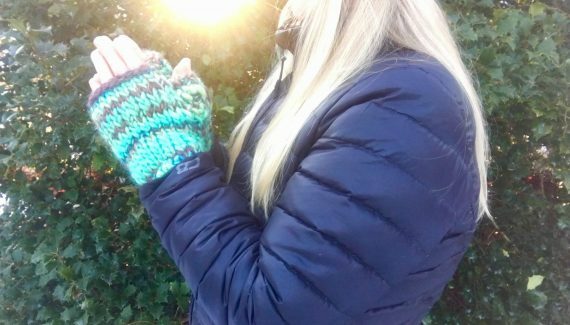 This pattern is suitable for advanced beginners who want to try something new, the Kitchener Stitch joining method. This avoids a noticeable seam, making your work look flawless. Don’t be intimidated. Although there are many steps, you’ll get the hang of it quite quickly. Plus it’s only the last part of the pattern. The rest is easy working in alternating Stockinette and Reverse Stockinette Stitch with simple increase and decrease on odd rows. 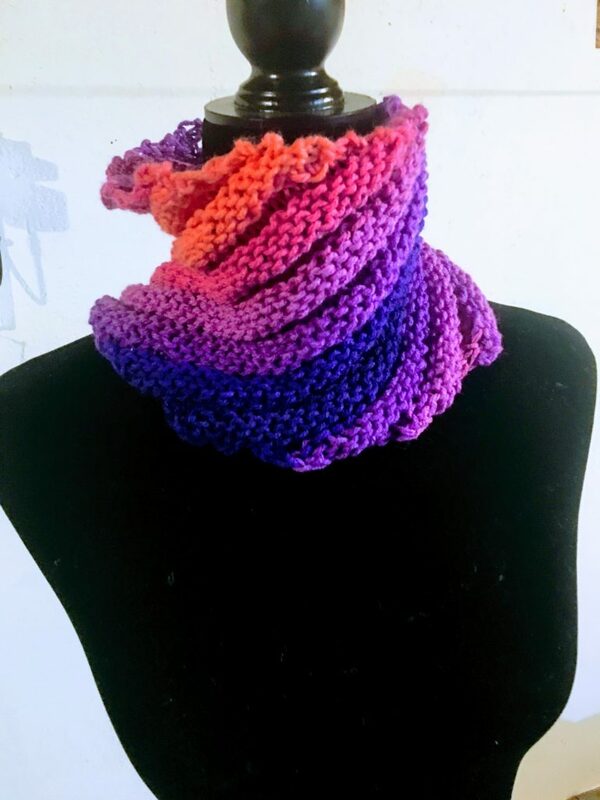 When you’re finished you will have a beautiful cowl with the colors of a majestic sunset to savor. 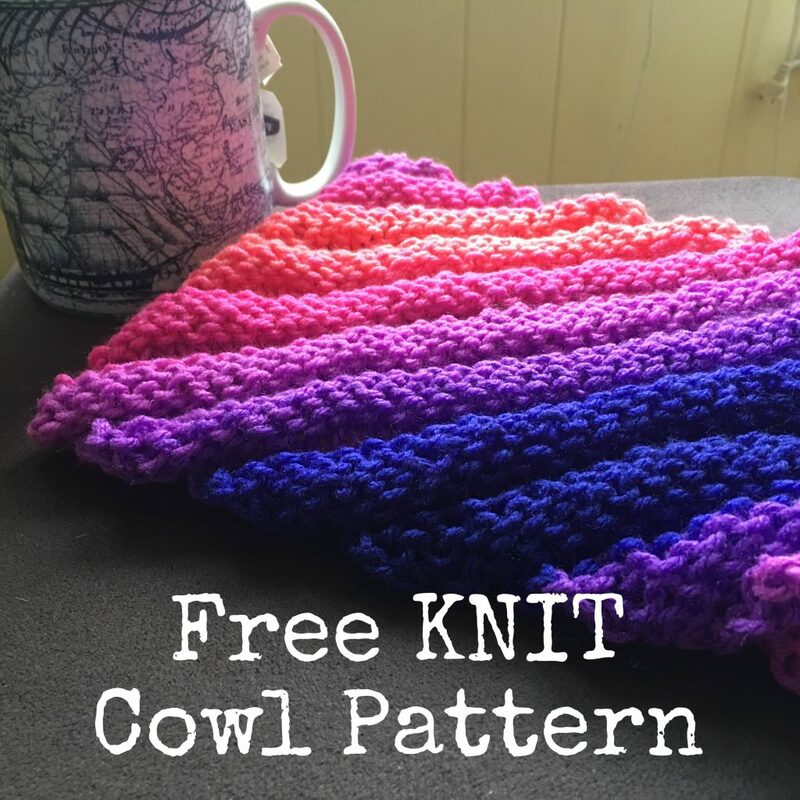 The FREE pattern follows BELOW in this blog post. 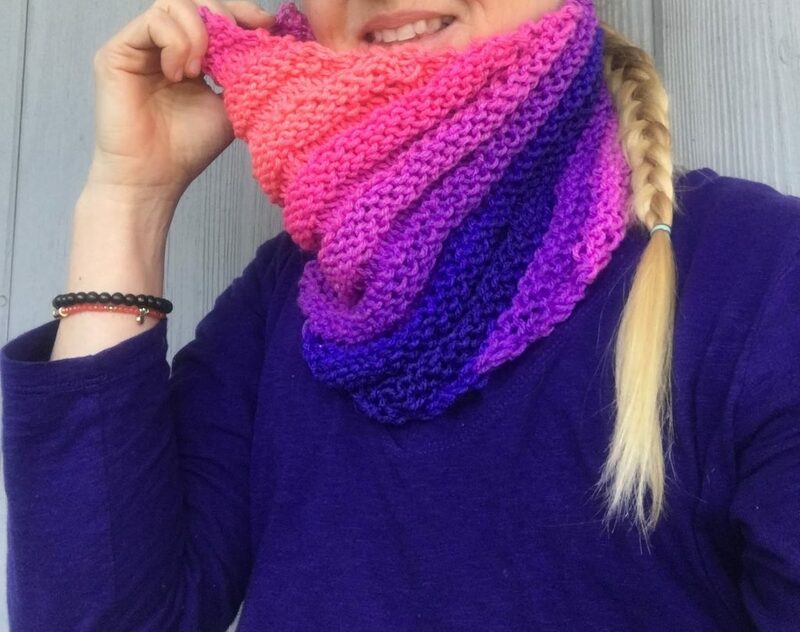 If you would like to own a convenient PDF of this pattern, Click here to download a PDF of this pattern for just $0.99. If you like this pattern, perhaps you might consider “buying me a coffee.” Thank you! Or Sharing this pattern on Pinterest, Facebook or your Fav social media. · 1/2 skein, 125 yards, #4 weight Red Heart Super Saver Stripes yarn – “Flamenco Stripe” colorway Or approx. 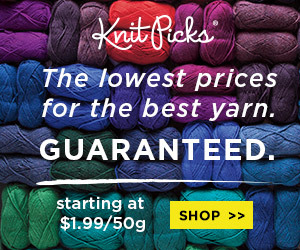 125 yards of worsted weight (# 4) yarn of your choice. 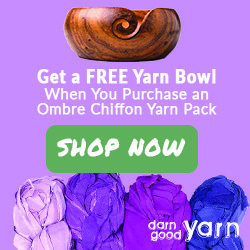 · 3 yards of contrasting color worsted weight yarn. Final measurements: One size fits all. You can always make it taller by casting on more stitches and you can make it wider by knitting more rows. 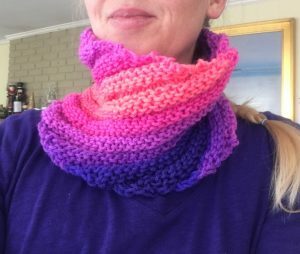 Easy Projects using yarn with basic stitches, repetitive stitch patterns, simple color changes, and simple shaping and finishing. Provisional Cast On: With crochet hook and contrasting color yarn make a chain of the number of cast on stiches. 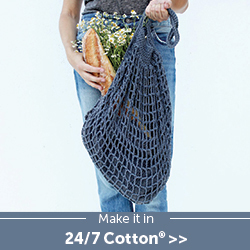 Pick up each chain stitch by the back loop and knit a stitch with your knitting needles. Step 1. Remove the provisional chain and transfer stitches onto second needle a few stitches at a time until all row1 stitches are on the second needle. Step 2: Using a yarn needle with the same yarn you used to work your project, hold the needles with the live stitches parallel in your left hand (for right hand knitters). Insert the yarn needle through the first stitch on the front needle as if to PURL. Pull the yarn through, leaving a tail that you will weave in later. Leave the stitch on the front needle. Step 3: Insert the yarn needle through the first stitch on the back needle as if to KNIT, pull the yarn through, leaving the stitch on the back needle. Step 4: Insert the yarn needle through the first stitch on the front needle as if to KNIT, pull the yarn through, removing the stitch from the front needle. Step 5: Insert the yarn needle through the first stitch on the front needle as if to PURL, pull the yarn through, leaving the stitch on the front needle. Step 6: Insert the yarn needle through the first stitch on the back needle as if to PURL, pull the yarn through, removing the stitch on the back needle. Step 7: Insert the yarn needle through the first stitch on the back needle as if to KNIT, pull the yarn through, leaving the stitch on the back needle. Repeat Step 4 – Step 7 until all stitches have been worked. Every few stitches, check the tension of your work, making sure it matches your work’s tension. 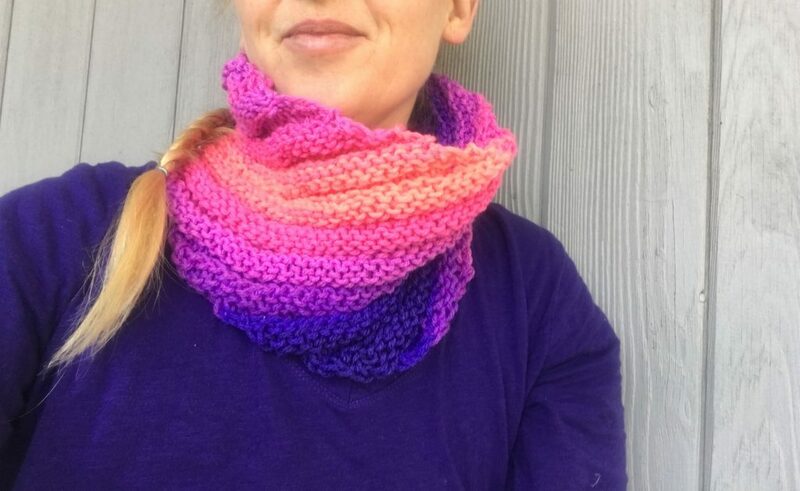 This is important because you are making an extra row of knitting rather than sewing together a tight seam. All Odd rows are Right Side rows. All Even Rows are Wrong Side rows. 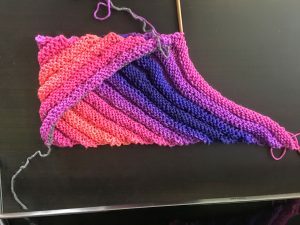 ON ALL RIGHT SIDE ROWS: Decrease 1 stitch using K2tog at beginning of row, and increase 1 by using KFB at the end of the row. You can place a pin marker on one side so to make it easy to remember if it is an increase/decrease row. 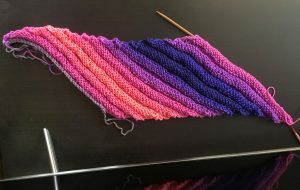 All Wrong Side Rows: simply knit or purl across according to the pattern below. 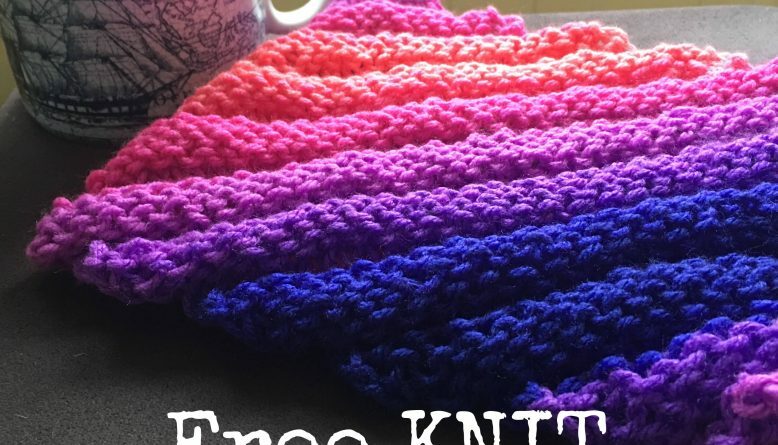 This pattern CAN be made without using the Kitchener stitch. 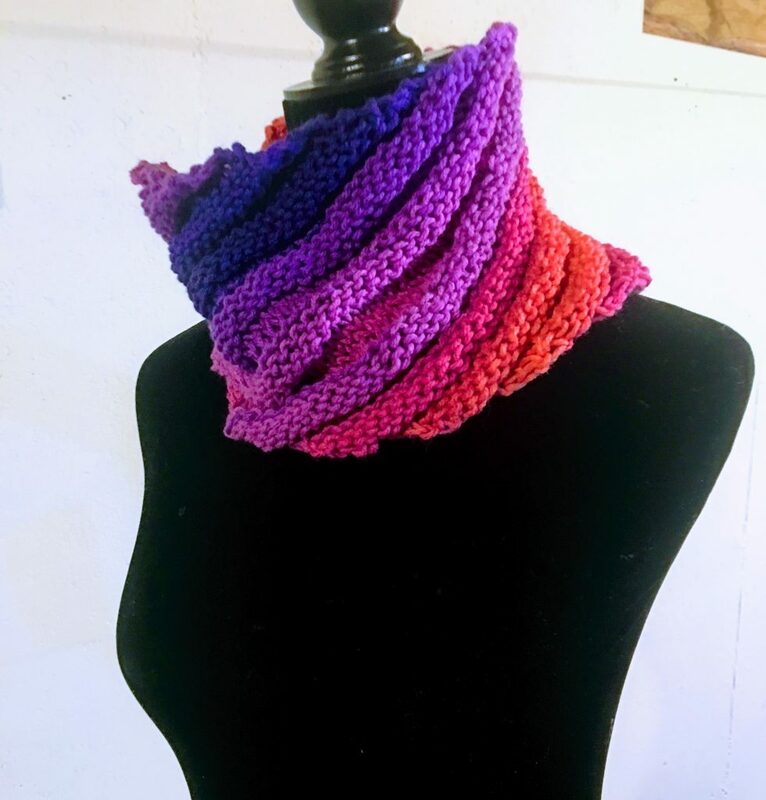 You would simply cast on in the working yarn and at the end you will bind off and sew the two edges together. I have made it both ways and the the sewing method is passable, but the Kitchener stitch is a superior finished look. Step 1: R1 (RS)-R2 (WS): Work Stockinette Stitch. Step 2: R3-R6 Work 4 rows Reverse Stockinette Stitch. Step 3: R7-R10 Work 4 rows of Stockinette Stitch. Step 4: Repeat Step 2 and Step 3 nine more times. Step 5: Work 4 rows of Reverse Stockinette and 2 rows of Stockinette Stitch. DO NOT BIND OFF. Step 6: Fold the two edges in towards each other forming a tube. 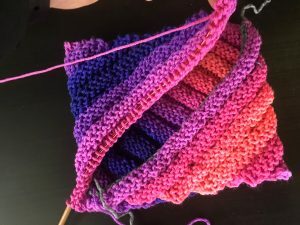 Using the Kitchener stitch instructions above, knit the two edges together. 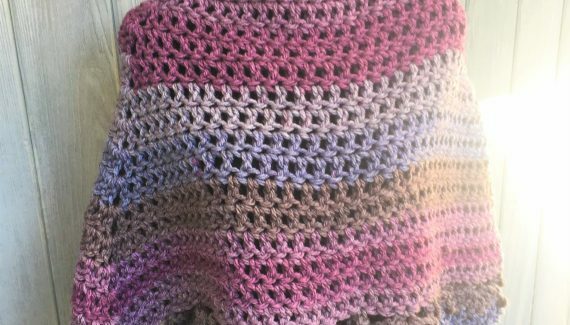 With yarn needle sew in loose ends. 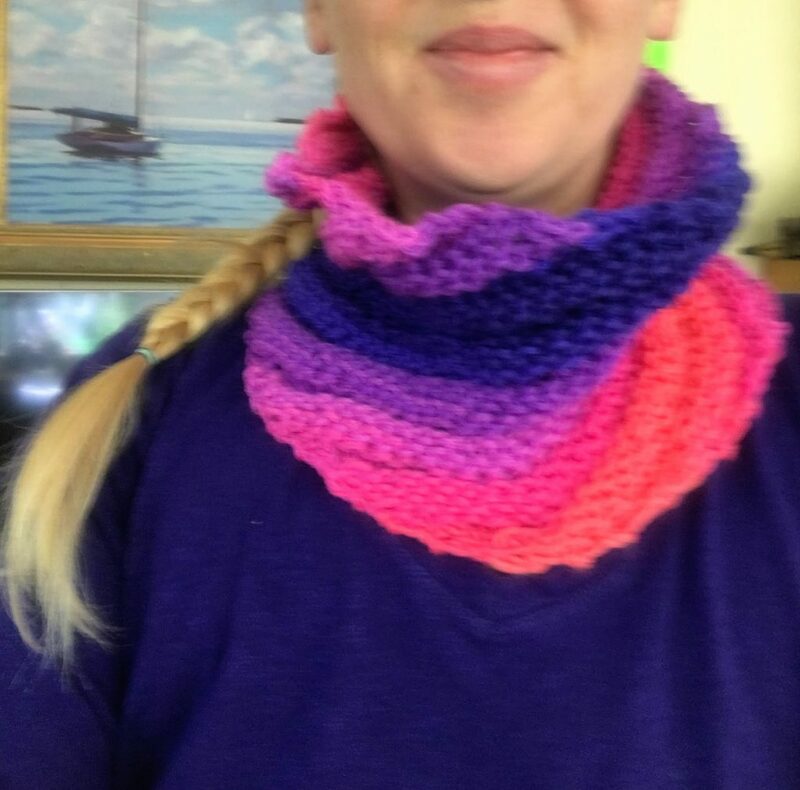 Enjoy your Sunset Stripe Cowl! Fold over other end. Join edges. 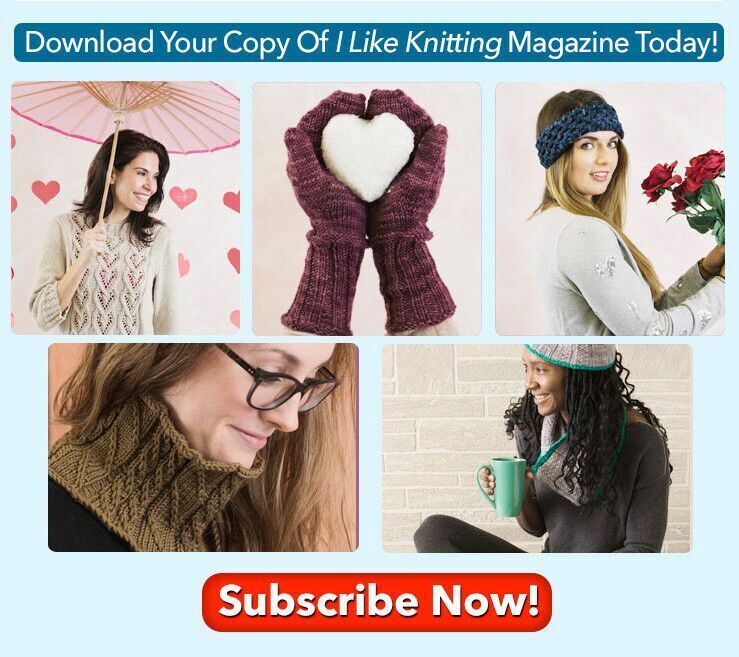 Subscribe for Updates and More Free Patterns! 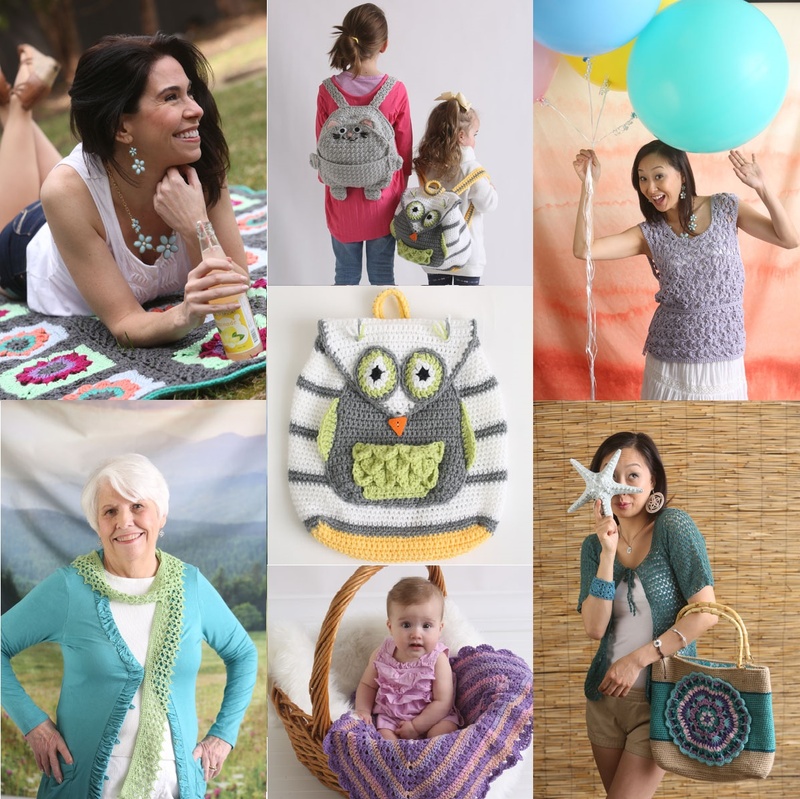 Remember to subscribe to get email alerts of new free patterns and video tutorials!